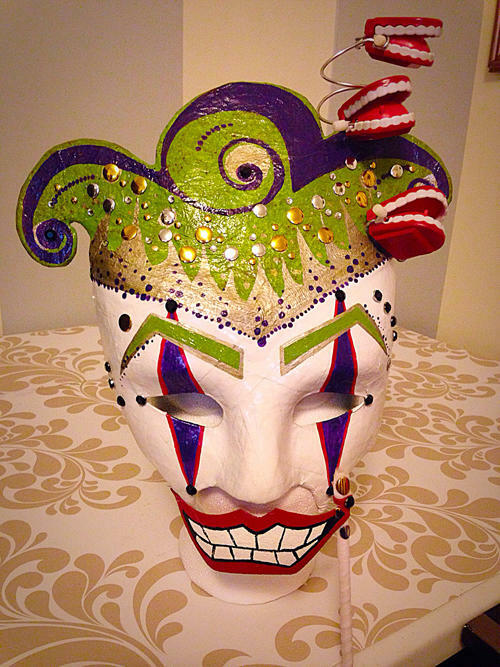 DIY “The Joker” Mask for Labyrinth Masquerade XII! My friend Jimmy (who happens to write/illustrate a great web comic that you should totes check out) is going to the Labyrinth Masquerade tonight! I’m super jealous because I can’t go, but I’m living vicariously by playing Fairy Godmother and sending him of with a custom made masquerade mask. He was just looking for something simple, but since Jimmy is a super fan of The Joker (from Batman) I was inspired to go for a Joker mask with a definite jester vibe. Here is my journey to the finished product. Enjoy! Next it was time to cover the whole thing with a papier-mâché . In the process I decided I wanted a slightly different texture for the hair and tried a new technique. Some tissues did the trick, but since they are so absorbent it took almost twice as long to dry as regular newspaper. Very happy with the results though! After the papier-mâché dried completely it was time to get down to painting. First I primed it with white primer from my total spray paint crush- Rustoleum. Then I used acrylic craft paint to do the rest and silver liquid leaf for some shinier accents. I sealed all my detail work with Rustoleum Crystal Clear Acrylic (My absolute favorite glossy sealer of ALL TIME). Once a few coats had dried I added some 3d accents for texture. Since I was going for a masculine look, the only rhinestones I used were black. For other accents I opted for iron-on metal studs…only I just used hot glue to attach them. Some inexpensive chattering teeth on wire gave me that extra Joker pizzazz to really put my mask over the top. The very last thing to do was attach the head strap. I attached black elastic to either side with epoxy glue and used hot glue to create a loop at the end of each piece of elastic. Using the loops I was able to thread through a piece of ribbon for an adjustable fit. I also found the mask rubbed uncomfortable against my nose but it was an easy fix. Just a regular makeup sponge attached with hot glue. Added a few matching embellishments to a Joker smile-on-a-stick that I made before and voilà!